I'm thrilled, flattered, and still in a bit of a daze. Farmgirl Fare was chosen by the Blogger.com Team to be the June 15, 2006 Blog Of Note. So we've had a few more visitors than usual lately. Like about 12,000 more. Welcome new readers (please click here for a brief intro to this site) and many, many thanks to the Blogger Team for bestowing this honor on Farmgirl Fare. Like I said, Wow. Attention Cat Lovers! This Is Weekend Cat Blogging #54! See fun feline photos & discover tasty new food blogs. Visit my pal Clare & her cool cat Kiri over at Eat Stuff in Australia for all the links to this week's kitties. For more cat candids, catch the traveling Carnival Of The Cats each Sunday night. And the weekly Friday Ark boards everything from felines to flower spiders. Hungry for more than pet pics? Don't miss the delicious and informative Weekend Herb Blogging roundup Sunday night at Kalyn's Kitchen. *Click here if you'd like to see more photos of Farm Boss Patchy Cat. Congratulations, Farmgirl! You inspire us all. Yay, Farmgirl! Well-deserved. Your new viewers will quickly see what all the hoop-la is about! The cute animal photos have a knack of brightening my day!! Very cool. Your blog is so unique and interesting, you really do deserve it. Congratulations on being a Blog of Note. It's so much more interesting than all the others listed. I mean really, how can networking compare to cute, furry animals! CONGRATULATIONS!!! The honor is well deserved. what a beautiful picture. The kitty seems to be "ruling the roost" as it were. Your linked on my blog as well. As your blog reminds me so much of where I grew up (central rural Illinois)-I tend to visit often for a taste of my roots. Feel free to visit my blog anytime! Awesome site, Farmgirl! I discovered you through Blogs of Note and would like to add you to my Links list, if it's OK with you. I grew up with my grandparents in west central Georgia, and my granddad raised hogs and cattle; Grandma usually had chickens running around the back yard. I've long been away from the rural life, though, even though my sister and I still own land across the road from the old farmhouse. One day I hope to move back there, build a small house, and start an organic peach orchard. I currently live and teach in a small town and have acquired my first chicken, a Rhode Island Red who averages an egg a day. Your site's awesome, and your story's really interesting. It tells me that people like us (I'm a college English prof) really can make a living and a life in the country, and leaving the city/academic/artsy life can be a beautiful thing. Keep up the great work. Was also sent here from blogger. Really enjoying your blog, keep it up! Great cat photo. And congratulations for being chosen the June 15 Blog of Note. Congratulations. I stop by nearly every day to see what you and Cary are up to. I also love your garden site. I have subscribed to your blog so I won't miss anything, and I am looking forward to going back and reading your story from the beginning. And hopefully I will learn something in the process. I only have 6 acres but I would really like to try growing something. Unfortunately, the green thumb in my family skips a generation and I'm the generation it skipped! I also have to figure out how to quit my day job. Great blog-- keep the adorable pictures of Cary coming! Congratulations! Yr blog definitely deserve it since it's always filled with fantastic stuff. Patchy Cat does look very curious abt the visitors. Fg you know how immensly proud I am of you! Congratulations! Your site is so great; you deserved it! as everyone else has mentioned the recognition is well deserved......thanks for your guidance. Funny we both left CA for God's country. MO is the nicest place I have ever lived. My wife and I live near Branson in Reeds Spring with two cat inside and one WILD cat outside. Yes food becomes a love down in these parts if you have lived anywhere else. Why do you think the food down here, overall, is so bad? 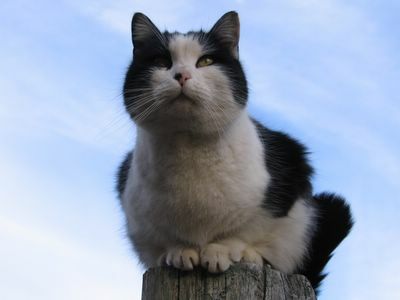 Just want to say, I love that photo of the cat on the post, nice one! And conrats on the Blogger bit too. Great blog! You deserved the recognition. That was a beautiful picture of the cat, too. First things first: that's a GREAT picture of the Patchy Cat! ...oh, and congratulations on blog of the day! Sorry I didn't jump right on it but I'm just catching up on things...you deserve all the attention you get...!